We’re sharing a comprehensive Camping Food List to help take the stress out of meal planning for your next camping trip! Breakfast, snacks, lunch and dinner, it’s all here. Over the years we have found a food packing system that works really well for us on our camping trips. Now we can get packed for our trips pretty quickly. We have found that if we come prepared with basic ingredients, our meal planning is way less stressful. It’s not a complicated system at all. In fact, it’s all about packing staples, then adding fresh goods. And if we have a few camping trips planned over a short period of time, I will even keep the non-perishable items in separate bins, so they’re all ready to go when we are. 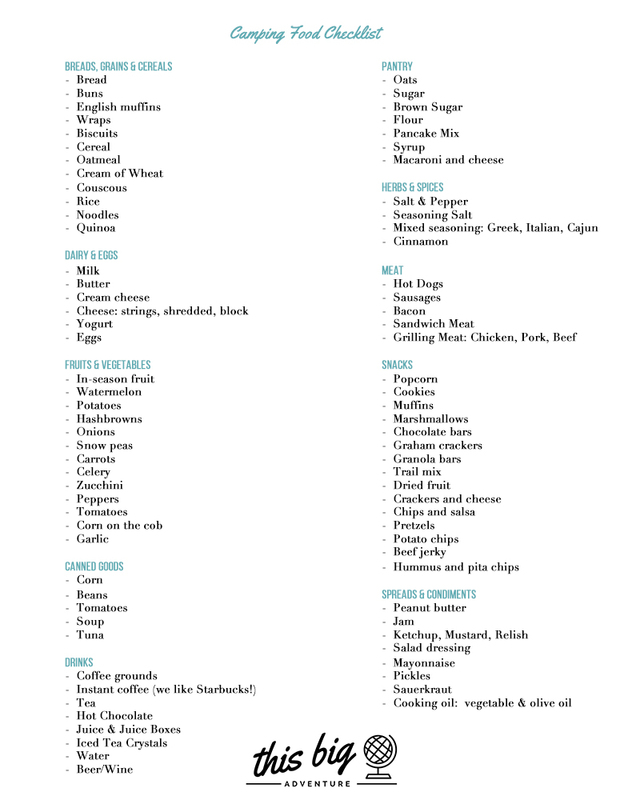 Here is the camping food list that we refer to time and time again. We don’t bring everything each time we go out camping, instead we just refer to the list to see if there’s anything we might want or may have forgotten. We hope you will find it useful too! You can download it here. Make wraps for lunches: Roll up sandwich meat, or veggies with cream cheese, or stuff wraps with left over rice or quinoa, veggies and meat for lunch. Roll up wraps with peanut butter, jam and bananas for breakfast. Wraps are great to pack for hikes and car traveling! Use English muffins for egg breakfast sandwiches. If you pack the right staples you can make homemade buttermilk pancakes. But honestly, buying a box of mix is the easiest! For lunch make sandwiches with the tuna, or cream cheese, or sandwich meat. Peanut butter and jelly is a great lunch staple too! Used leftover cooked quinoa or noodles to make salads for lunch. Just mix in some chopped vegetables and cheese, then toss in salad dressing. Coffee Tip: We discovered the instant coffee from Starbucks and it’s so delicious. And SO easy to pack and make. Keep a stash of easy snacks. When we’re driving to our camping destination, I like to have a cooler filled for the car ride. I pack it with snacks like cheese strings, yogurts, muffins, granola bars, juice boxes and water. Make tin foil packet meals, side dishes or desserts: potato packets, root vegetable packets, potato and sausage packets, dessert crisps. You can make pretty much anything in a tin foil packet. One dish dinners are great: meat and vegetables in one pot cooked over the campfire. We make a lot of sausage and vegetable skillets. Bottled water is handy, but wasteful. We like to bring a large container of water and re-useable water bottles from home and refill as needed. Seasoning salt is your camping best friend. You can add it to anything and it makes everything taste delicious! Pre-made packaged hash browns are so great for camping. Use them for breakfast or a side dish at dinner. Just heat them up in a skillet over the campfire or stove. We hope you find this useful for your next camping adventure! Next ArticleRoad Trip: An Adventure Filled Day Trip From Calgary! Trader Joes has a box of instant coffee packs that also include cream & sugar that we took camping last weekend and I stirred a pack of hot cocoa mix into mine to make an instant mocha! YUM!